UPDATE: The Scavenger Hunt and the Bonus Contest are now closed. Thank you for playing!! The YA Scavenger Hunt is a bi-annual event that was first organized by author Colleen Houck as a way to give readers access to exclusive bonus material from their favorite authors … and a chance to win some awesome prizes! At this hunt, you not only get exclusive content, you also get a clue for the hunt. Add up the clues, and you can enter for our prize. One lucky winner will receive one signed book from each author on the hunt in my team! But play fast: This contest (and all the exclusive bonus material) will only be online for 72 hours! Go to the YA Scavenger Hunt page to find out all about the hunt. There are EIGHT contests going on simultaneously, and you can enter one or all! I am a part of TEAM TEAL, but there is also a red team, gold team, orange team, purple team, blue team, pink team, and green team … so you have lots of chances to win! If you’d like to find out more about the hunt, see links to all the authors participating, and see the full list of prizes up for grabs, check out the the YA Scavenger Hunt page. Directions: Below, you’ll notice that I’ve listed my favorite number in BOLD RED. Collect the favorite numbers of all the authors on the Teal Team, and then add them up. Entry Form: Once you’ve added up all the numbers, make sure you fill out the form here to officially qualify for the grand prize. Only entries that have the correct number will qualify. Rules: Open internationally; anyone below the age of 18 should have a parent or guardian’s permission to enter. To be eligible for the grand prize, you must submit the completed entry form by Sunday, October 4, at noon Pacific Time. Entries sent without the correct number or without contact information will not be considered. NOW … ON TO MY POST! A little bit about me: My name is Linda Budzinski (which is why my blog is called “Linda Budzinski” … very creative of me, I know!). 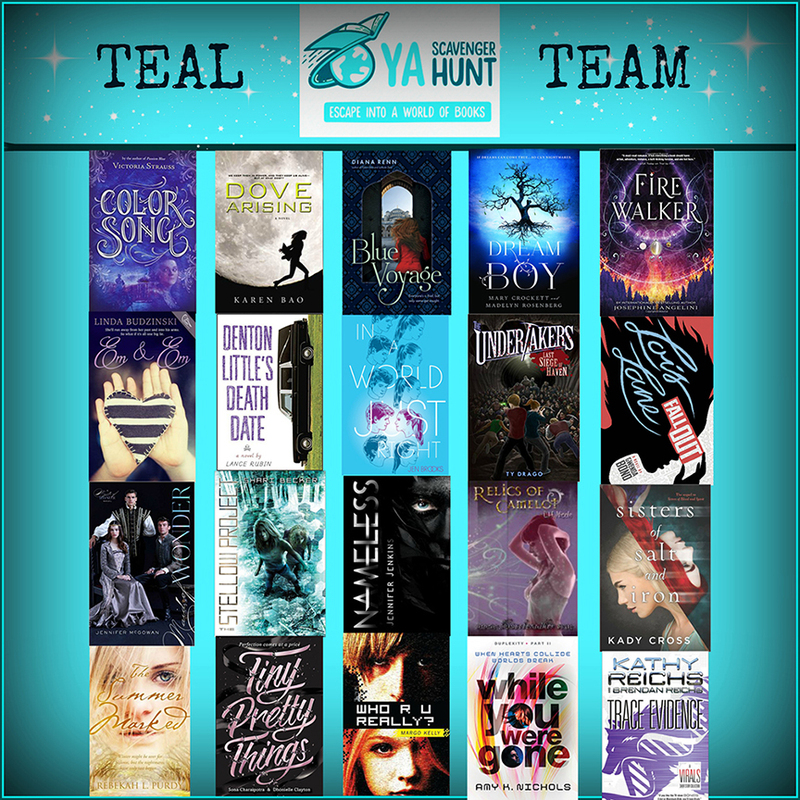 I’m author of the first book in the second row on the TEAM TEAL logo … EM & EM! It’s a YA romance with a mystery twist. I live in Northern Virginia, work in nonprofit communications, and love chocolate, The Bachelor, and daisies. Oh, and my chihuahua, Demitria, is my faithful (if not terribly helpful) writing partner. FEATURED BOOK: MAID OF WONDER, BY JENNIFER McGOWAN! Today I am thrilled to be hosting YA Historical Romance Author Extraordinaire Jennifer McGowan! Jenn was born in Ohio, grew up in Montana, and studied in Paris. She fell in love with the Elizabethan era as a college student and is now an unrepentant scholar of the period, happily splitting her time between the past and present. 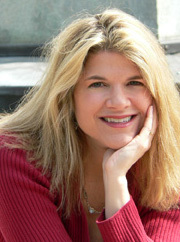 A Romance Writers of America Golden Heart Award winner and multiple finalist, Jenn is the author of the Maids of Honor series. She lives in Ohio. Visit her (and the Maids of Honor) at JenniferMcGowan.com. Sophia must master her psychic ability if she is to save the life of Queen Elizabeth and her fellow maids from a dark prophecy. In this third book of the Maids of Honor series, Sophia Dee, the most unusual spy of Queen Elizabeth’s Maids of Honor, has run out of time for her psychic skills to fully manifest. A terrible new prophecy haunts Windsor Castle, and the Queen demands answers before the next doomed soul dies. Thrust into a dangerous and horrifying competition to solve the deadly prediction, Sophia finds herself pitted against the most celebrated mystics of Europe: John Dee, her devious uncle and the Queen’s personal astrologer, and Nostradamus, the renowned prophet-seer of France. In a court where whispers of witchcraft, poisonous plots, and grim assassins threaten her at every turn, Sophia needs answers fast. But does she dare trust Marcus Quinn, her uncle’s striking and overambitious assistant? Or, instead, should she turn to the tortured dark angel of the spirit realm, who whispers to her only of sorrow and death? As new dangers surface and the dire prophecy sweeps toward its final victim, the five Maids of Honor prepare to do battle. Only then will the girl who so often sees the future finally discover if she can save the Crown — and herself. Oooh, Nostradamus! Sign me up! AND NOW … THE MOMENT YOU’VE BEEN WAITING FOR … THE BONUS MATERIAL! A rustle of movement sounds to my right, and, smiling, I turn … then freeze. It is the dark angel. And for the first time ever, I realize my grim specter is a he. The heavy hood still hangs over his face, all flames banked for the moment, but the dark angel’s cloak is flung back to reveal a powerfully built masculine body. He is nearly as robust as Beatrice’s Alasdair, and his clothing is as fine as any courtier’s in Elizabeth’s circle, all in jet black: doublet, breeches and fine black hose, leather boots. I don’t recognize that I’m staring at those boots until the spirit’s feet shift, and I realize he is performing the Honor, the first step in any proper dance. Startled, I lift my head to search his face — and meet only shadows. I do not trust myself to speak. Never before has an angel tried to approach me in this way. I sense it is forbidden, an unwritten rule of the realm. I am mortal, they are spirit. Never the twain shall meet, else…. Ignoring my mute objection, the dark angel moves around me, mimicking the dance he observed naught but a few hours ago. He watches me from the darkness of his hooded cowl, and I find myself curtsying to him in turn, then rising up. He positions his hands as the dance requires, and I place mine next to his — close, but not touching him. The dark specter sought me out in my own realm, after all. Clearly it — he — wants to speak to me. If he wishes to dance with me as well, I can be accommodating. “What can you tell me?” I ask. My voice is breathless, though we are circling each other most sedately. Still, I feel tired, as if my energy were draining away. Life, it is this dancing, stepping forward, hastening back. The dark angel’s words recall me to his face, or, rather, to the darkness that passes for his face beneath the cowl. I smile tentatively, not sure how to respond. He nods, and I breathe a tiny sigh of relief. Still, no sooner have I relaxed than his words sound again. This time, however, they are solely in my head. See this gathering of spirits. Look but quickly, then away. To dance your dance, to ever stay. I frown, but I do as he instructs, glancing over at the collected assembly of spirits. The dark angel is correct, I suppose. There is an intensity in the way the other spirits watch me, but no more so than I felt in the dark angel himself as he watched me dance with Marcus. The laughter that skates across my senses is low, dangerous. Can the dark angel read my thoughts? If so, I dare not wait any longer to ask my questions. Do not rush into this madness. Do not fall, ever to stay. Do not heed the call of sirens. Flee this place, away, away. He moves so quickly then that I can only gasp. His gauntleted hand reaches out and cups my chin, lifting my face up to his. How is he touching me? This is not allowed! And yet, at the moment when I feel the dark angel’s forbidden touch, my mind is filled to bursting with, sounds, images, and words. I see the young, chestnut-haired man in his bed once more, dead. I see Walsingham at his side. I see five women, my fellow maids and myself, in the midst of some great revel — as if we were part of it but with our own unique roles, a play within a play. Positioned like the tips of a five-pointed star, each of us holds a sword high in the air between our clasped hands, our eyes glowing bright. We are possessed of an eternal inner fire, able to see in utter darkness. At our center is the Queen, and we all stand upon a circular snow-white field, bisected with a black cross. I remember this place, of course. It’s where the Queen will die! I am smote with an impossible urgency, and suddenly I understand. When the Queen takes to this white field, I will be close enough to save her. If I move quickly, she will vanquish death. I simply need to reach her. I must reach the Queen! The dark angel seems to shudder, and I sense that both his hands are pressed to either side of my face as he stares intently at me, my mind filling with bright, discordant images. Now I am back in the Lower Ward, rushing through the collection of carts and animals and people. I seem to be searching for someone, desperate to find her, when the carts suddenly give way and I dash into the open space. Before me an old woman in heavy shawls whirls around to gape at me, her hands flying up in a violent frenzy as if to warn me away. Her eyes are as white as milk. Pain explodes in the back of my neck. I scream in agony, reeling away from the dark angel as a bolt of fire lashes through me. I am nauseous with a heavy, roiling wrongness. At that moment a roar besets the glade, wind racing into the sacred space. I stumble to the side, half-collapsing onto the obsidian bench. I feel a cloying wetness on my cheeks and brush it away, but when I pull my hand back, my horror surges anew to see my fingers red with blood. My eyes are once again bleeding! The raging storm grows, and I realize that the dark angel has stepped away from me and is lost in the gale. “No!” I scream into the wind. I squint across the open space, but I cannot see the dark spirit anymore. But I can already sense the angelic realm slipping away, even as I feel the brush of something against my cheek, as light as a feather though it seems to scorch me to the bone. Arc, speaks a voice in my head, more pictures and thundering music than words, a word full of fire and desolation and loss. My name is Arc. So … wow! Just, wow! What an intense scene! Can’t wait to check this one out! I wonder if Jenn has any more books planned for the series? Hmm, there are five maids, so I’m thinking 5 would be a good number of books! Thank you so much for visiting my stop! I hope you’ll take a minute to leave a quick comment below on what you think of Jenn’s excerpt … did it give you chills like it did me? And now, onto the next stop, hosted by fellow Team Teal member Kady Cross! Good luck!! BONUS CONTEST: Leave a comment on what your Maid of Honor name would be … I’ll send some EM & EM swag to a randomly selected winner! My Maid name would be Charlotte. Just because I like the way it sounds. I actually jut bought Maid of Honor in September lol. Thanks for participating in YASH! I think Maids of Honour sound really good! I think mine would be Anastasia. Thanks for participating! Hi, Robyn! You’re my winner! Please contact me via my contact page with your address and I’ll get you set up with the EM & EM swag pack! I like Charlotte or Katherine. My Maid of Honor name would be Olivia. I have always loved that name and I think it would fit perfectly with the time period. My maid name is Constance. I really like the name Amara or Katrina and I think it would be very fitting for that time period! Subscribe to my LOVE YA Newsletter!